In the Pacific Northwest it is safe to assume that 8 months out of the year the largest contributor to your energy bill comes from heating your home. High efficiency air source heat pumps can significantly lower your home’s heating bill and provide energy-efficient air conditioning throughout the year. Heat pumps offer many advantages, and with current rebates available from PenLight, installing a heat pump has never been more affordable. Members who replace an existing heat pump with a new, qualifying energy efficient heat pump or add a heat pump to a system with natural gas, oil, or propane back-up or in new construction single-family homes are eligible to receive a PenLight Rebate of $400. Homes with a substantial amount of ductwork in unconditioned living spaces such as crawlspaces or attics qualify for an additional Duct Sealing Rebate of $250 to offset the cost of optional PTCS duct sealing. Members who convert an electric forced air furnace to a high efficiency heat pump may receive a PenLight Rebate of $1,000. 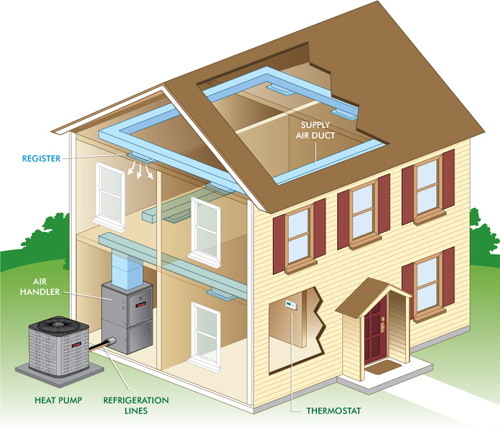 To qualify, the heat pump must be the home’s primary heating source. Homes with a substantial amount of ductwork in unconditioned living spaces such as crawlspaces or attics qualify for an additional Duct Sealing Rebate of $250 to offset the cost of optional PTCS duct sealing. A duct system that is well-designed and properly sealed can make your home more comfortable, energy efficient, and safer. Yes. But the Heat Pump Rebate requires the contractor to be Performance Tested Comfort Systems (PTCS) Certified by the Bonneville Power Administration to participate in the program. Be sure check with the contractor of your choice before they begin work to ensure qualification for your rebate! All rebate forms are to be completed and submitted by the Installation Contractor. For more information call 253-857-5950 or send an email to our energy specialist. Need Adobe® Reader to view PDF files? The download is free from Adobe.